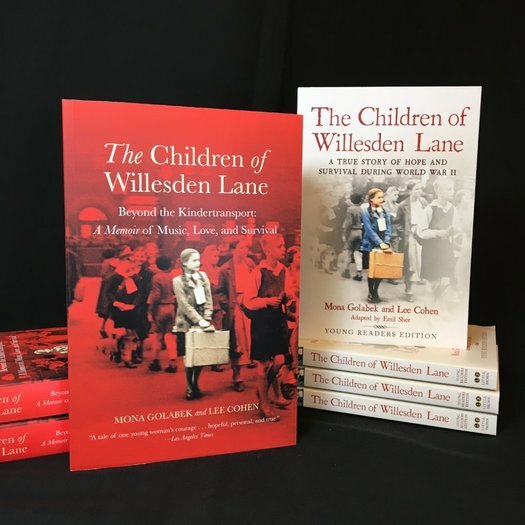 Westport Country Playhouse will offer a free-of-charge performance to “The Pianist of Willesden Lane” for students at Connecticut schools adopting the “Willesden Reads” program into their curriculum to study the Holocaust. “Willesden Reads” is a program of the Hold On To Your Music Foundation, established in 2003 by Mona Golabek, who stars in “The Pianist of Willesden Lane.” The Foundation’s mission is to expand awareness and understanding of the ethical implications of world events such as the Holocaust, and the power of the arts, especially music, to embolden the human spirit in the face of adversity. Free or reduced-cost copies of the book “The Children of Willesden Lane,” upon which the play is based, have been distributed to area schools participating in “Willesden Reads.” Classroom activities surrounding the book will culminate in students attending a performance of the play on Thursday, December 13, at 10:30 a.m., followed by a Q&A with Golabek. Connecticut students participating in “Willesden Reads” are fifth, sixth, seventh, and eighth graders at Bridgeport’s Park City Magnet School; seventh graders at Norwalk’s Nathan Hale Middle School; and ninth graders at Burlington’s Lewis S. Mills High School. “Willesden Reads” has reached over 300,000 students nationwide. “The Pianist of Willesden Lane” is set in Vienna in 1938 and in London during the Blitzkrieg. Lisa Jura, a 14-year-old Jewish girl, spends her time practicing piano, dreaming of becoming a concert pianist. But with Hitler’s armies advancing into Vienna, her parents obtain passage for her on the Kindertransport, forcing Lisa to leave her family behind and put her future on hold. Mona Golabek, who is Lisa’s daughter, takes the stage to share her mother’s gripping tale of escape and the people she met on her journey. Golabek intertwines the true story of family, hope, and survival with piano selections by Grieg, Chopin, Beethoven, Debussy, Bach, and Gershwin. The family-friendly show is appropriate for children age 10 and up. “The Pianist of Willesden Lane” runs from December 5 through December 22. Tickets start at $30; student/educator tickets are $20. Performance schedule is Tuesday at 7 p.m., Wednesday at 2 and 8 p.m., Thursday and Friday at 8 p.m., Saturday at 3 and 8 p.m. and Sunday at 3 p.m. The presentation, adapted and directed by Hershey Felder, returns to the Playhouse by popular demand after a successful run in April 2017. Education Partners for this production are Judy and Scott Phares. Additional support is provided by the Federation for Jewish Philanthropy of Upper Fairfield County and Jewish Federation Association of Connecticut. For information on the “Willesden Reads” program, contact Jennifer Carroll, Playhouse community and sales manager, at jcarroll@westportplayhouse.org. For tickets, call the box office at (203) 227-4177, or toll-free at 1-888-927-7529, or visit Westport Country Playhouse, 25 Powers Court, off Route 1, Westport. Tickets are available online 24/7 at www.westportplayhouse.org. Stay connected to the Playhouse on Facebook (Westport Country Playhouse), follow on Twitter (@WCPlayhouse), or view Playhouse videos on YouTube (WestportPlayhouse).